The rugged new Subaru Forester Estate is all about providing a practical and reliable experience for the family. It’s recently been given a facelift to improve its sense of style, and it’s hard to beat in terms of usability. Make no mistake, though – this is very much a crossover aimed at families who care way more about functionally than style. Everything about it is designed to cope with family life, and to that end it could be the dependable large car you’ve been looking for. OSV takes a closer look at what it’s all about with our 2017 Subaru Forester Estate review. What you want from a hefty machine like this is a car that’s going to arm you with lots of grip and confidence – and the Forester does just that. Four-wheel-drive is standard, and it gives you the confidence to tackle corners with relish. The suspension is a bit on the firm side, but we wouldn’t say it’s all that noticeable, even over bumps and lumps. All engines are paired up with a 6-speed manual ‘box as standard, while a CVT automatic is optional. We’d recommend overlooking it, though, as it holds onto the higher revs as you accelerate, thus ruining the refinement. Moreover, it gets artificial gears, with Subaru indexing certain ratios. Does this really make sense with a CVT system? That said, the CVT ‘box improves the way the Subaru Forester Estate handles. And if you opt for the CVT, you get an X-mode system thrown in, which improves the cars off-road prowess. In terms of the engines, the 2.0-litre diesel is destined to be the most popular. It develops up to 145bhp, and does 0-62 in just under 10.0 seconds. It has lots of low-down oomph, and can make good progress when setting off from lights. It’s our top pick. The only petrol engine in the range is a 2.0-litre unit that’s available in two power guises, starting with 148bhp. As it’s slower and more expensive than the diesel, it’s hard for us to recommend. The alternative is a turbocharged 238bhp variant that comes with the CVT auto as standard, and which blasts its way from rest to 62mph in 7.5 seconds. Take the windscreen pillars, for example. They’ve been shifted forwards, while blind spots have all but been eradicated by taller windows. All of this and more has been designed to improve ease of use, and it’s worked. 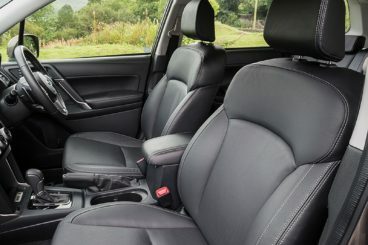 The seats are comfy, with the top-spec models getting leather upholstery, and insulation is good. The dash won’t win any style points, but if you can take functional and plain, you’ll appreciate it. It’s tough to stand up to everyday family life on the road, and straightforward enough to make it easy enough for you to find the right buttons and use them. But it’s practicality that’s key in this sector, and that’s where Subaru has put most of their focus. It might not look great, but the Forester Estate is sure usable. Headroom is excellent, there is enough room for three adults to get relatively comfy in the back, and the steering wheel adjusts for both reach and rake. The boot measures 502-litres, which makes it par for the course in this class. It can be extended to 1,592-litres by folding the rear seats, while its lip is low and its opening is nice and wide. The rear seats are easy to fold too, thanks to a one-touch folding mechanism. Even better, the seat belts get out of the way real quick so that they don’t tangle. Standard kit is good, with the entry-level models getting Bluetooth, dual-zone air conditioning, a reversing camera, folding door mirrors, enhanced HID headlights, a sunroof, and automatic windscreen wipers. All models above the base-level trims get a touchscreen as well as a multi-function display, while the range-topping model adds LED lights, 18” alloys, as well as twin exhaust pipes. Is the Subaru Forester Estate safe? Impressively so. It bagged all five stars when crash-tested by Euro NCAP, and gets EyeSight driver-assistance tech, ISOFIX child-seat mounts, four-wheel-drive and airbags as part of its standard safety kit. It also comes with lane-keeping assistance, lane-departure warning, and adaptive cruise control. Prices for the new car start out from £26,495 and rise to £32,495. If you prefer to lease, you can pick up a deal from £432 + VAT per month. For more information on our leasing deals, check out our page here. In terms of its running costs, the Forester does okay – provided you overlook the petrol. Four-wheel-drive is standard, and without the option of two-wheel-drive, the Forester is always going to be a heavy car that gobbles up fuel. The most frugal engine in the range is the 2.0-litre diesel, which averages just less than 50mpg economy while emitting 148g/km of CO2 if you opt for the manual ‘box. Go for the automatic, and the costs go up a bit. The 2.0-litre petrol engine, on the other hand, will stubble to return 43.5mpg at best, and emits as much as 160g/km. The 2.0-litre XT model, meanwhile, might offer more performance, but it punishes you with returns of 33.2mpg at best. The Subaru is unquestionably robust and will stand the test of time. Four-wheel-drive is standard on all models, and it arms the car with plenty of grip. You get a commanding view of the road, which helps you to feel safe and secure. No model returns more than 50mpg economy. 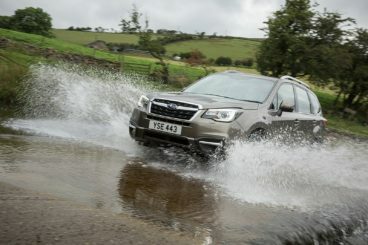 Unlike rivals who offer a lighter, more economical two-wheel-drive variant, the Forester is strictly four-wheel-drive. Let’s see how the car fares against its rivals in the comparison section of our 2017 Subaru Forester Estate review. 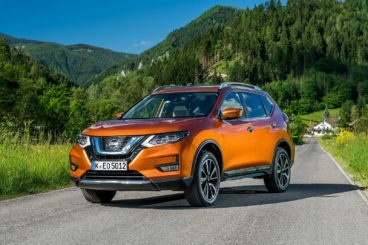 The new Nissan X-Trail Station Wagon is a beast of a car that’s stylish, efficient and spacious. On the road, you shouldn’t get your hopes up too much. This is not an off-road warrior by any stretch of the imagination, and is best described as a bigger Nissan Qashqai. There is a decent amount of grip on offer, it handles well enough, and the engines feel sprightly. Chassis Control has been added to make up for the lack of feedback from the steering wheel, while Active Ride Control helps to stabilise the X-Trail over rougher surfaces. Four-wheel-drive, however, is optional and not essential. In terms of the engines, a 1.6-litre 128bhp kicks things off. It’s got a decent amount of pulling power, but doesn’t have enough power to cope with a fully loaded X-Trail. Stick to two-wheel-drive, though, and it can sprint from rest to 62mph in 10.5 seconds. A 175bhp 2.0-litre diesel engine has a bit more steel and speed, and can do the 0-62 dash in 9.4 seconds. There is only one petrol option available, a 1.6-litre unit that develops 161bhp and can get you from a standstill to 62mph in 9.7 seconds. It’s quiet, but does need to be worked hard to get the most out of it and is two-wheel-drive only. Where running costs are concerned, the 1.6-litre 128bhp diesel engine returns a respectable 57.6mpg, while emitting 129g/km of CO2. Add four-wheel-drive and those numbers worsen, but not significantly. The 1.6-litre petrol engine, meanwhile, returns 45.6mpg and emits 145g/km of CO2. Inside, the Nissan X-Trail Station Wagon excels. It’s stuffed with standard kit, with the entry-level models getting a 5” colour screen, Bluetooth, air conditioning and a DAB radio, while the restrained design of the dashboard is tasteful and stylish in its own way. Thanks to the addition of lots of soft-touch materials and a tidying-up of the controls and buttons, the cabin even looks and feels upmarket. It’s a genuinely welcoming environment. The steering wheel and seat offer lots of adjustability, and the seats are comfortable and supportive. Everything about the car just feels big, too. There are enough head and legroom for all, upfront and in the back, and we love the theatre-esque arrangement of the seats, whereby those behind each row are raised up. Indeed, the way the Nissan X-Trail Station Wagon accommodates the driver and passengers are what gives it the edge over competitors. No other model in this class has more legroom, while the middle row can be slid back and forth for even more legroom, or more boot space. With all five seats in the right place, the boot measures 565-litres, extending to 1,996 if you fold all the rear seats. If you decide to go for the seven-seater X-Trail, you get 445-litres of boot space. 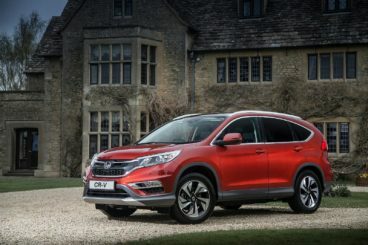 The new Honda CR-V Estate is one of those large cars that could tell you all you need to know about them with just one look – namely, that it’s going to be strong and assured on the road, dependable, reliable, safe and practical. In other words, it’s exactly what families want. But how accurate are first impressions? It’s the kind of car that looks like it’s got plenty of character and is up for a challenge on the road. However, Honda has set it up to be more comfortable than fun. There is plenty of grip, but there are also a few caveats. For a start, some versions comes with just two-wheel-drive. While this makes the Honda CR-V Estate more nimble and agile, it does lose some of that all-important grip. On the other hand, four-wheel-drive variants struggle with the extra weight and are consequently slow to respond. Body lean is also a big issue in bends, while the standard 9-speed auto box is unreactive at times. The biggest question is – why nine gears? In terms of the engines, OSV’s top pick is a 1.6-litre diesel unit that develops up to 118bhp, and which can thrust you from rest to 62mph in just 11.2 seconds. It’s not super flexible, but it comes paired with a slick 6-speed manual transmission. Aside from a bigger, four-wheel-drive 158bhp diesel that does 0-62 in 9.6 seconds and is mated to the 9-speed auto, there is also the choice of a solitary petrol engine that can complete the 0-62 dash in 10.0 seconds flat. It’s two-wheel-drive only but feels slower than its numbers suggest. It’s also not so economical, and returns less than 40mpg at best. This is in stark contrast with the 1.6-litre 118bhp diesel that’s good for 64.2mpg. The four-wheel-drive 158bhp diesel, meanwhile, averages 55.4mpg. Inside, there are things to like and dislike about the Honda CR-V Estate. It’s solidly built, which is what you as a family need. But some of the plastics are cheap, hard and scratchy. If you don’t mind that? It won’t be an issue. Moreover, some buyers will prefer the not-so-showy cabin. Furthermore, comfy seats and excellent insulation give it a bit of an upmarket flavour. True, the dashboard is plain Jane, but it’s easy to use. Not only is it a straightforward interior that will give you no problems, it’s also a practical one. Head and legroom are good up front and in the rear, and five adults can sit in relative comfort. Storage spaces are everywhere, including a massive glovebox and two door pockets for the front door. The boot is the icing on the cake. Measuring almost 600-litres, it’s the biggest in this class. It’s tall, spacious, and the Magic Seats can easily be folded entirely flat to reveal a colossal 1,669-litres of luggage capacity. How much a brand can change. From the halcyon days of yore when Subaru were the rally kings, to 2017, where their best car is a well-built, dependable and a spacious large family car. Overall, it’s a solid all-rounder that’s grippy, rugged, no-frills and capable. It’s just that it doesn’t stand out. Still, if you want to discreetly go about your business in a hefty, four-wheel-drive machine that won’t let you down, the Subaru Forester Estate is a solid choice.